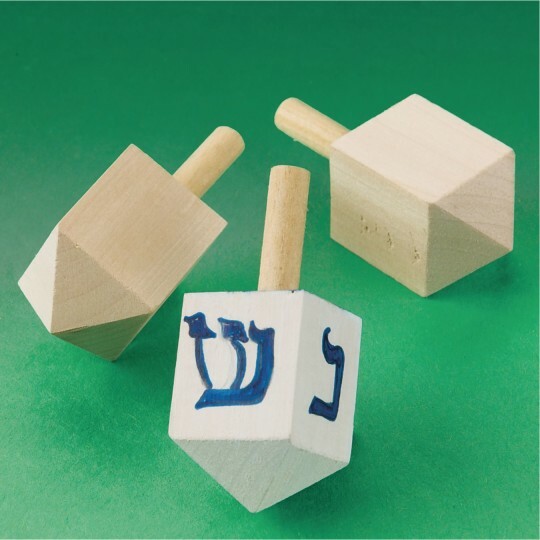 Kids of all ages can celebrate Hanukkah by painting their very own wooden dreidel and learning the significance of the Hebrew letters they trace onto each side. This activity will enhance creativity and social interaction as kids talk about the meaning of Hanukkah and other favorite holidays. Includes wooden dreidels, acrylic paint, carbon paper, brushes and instructions. 2-3/4" x 1". Pack of 24.
this was used in our gift shop during our Bethlehem village in December each year. The dreidels are fun to paint using different colors. One for the background and the other for painting nun gimel he and shin on each side. They also make good Hanukkah gifts.